Short term VS long term trading! In my gold trade from January 05., which I have presented yesterday here, you can see how huge can be difference between short term and long term trading and what is the ‘risk’ from long term trading, if you are a retail trader. But, can we call that as a risk and how to react properly in the situations like this one? Is this stressful situation for long term traders? Well, I wrote in my trade, that this is at least intra-week trade and maybe a longer one, if the technical levels stays in my favor at the end of the week. I knew and I was pointed at this resistance at 1110/15 as a strong one in my previous gold analysis and I was aware of possible gold return, but I stayed anyway. Is it stressful? No, because I don’t look at this return as a lost 150 pips, but as a winning trade with +200 pips for now. What if the gold price fall at the entry level and close the position at Break Even? Nothing! In that case, I will wait for another opportunity like this and try again. If I am still confident in my prediction, that the price will go up toward my target, should I open another long here? No, because I will be in risk to lose both positions in that case, if the price go lower from here. Should I close it now and take the profit? It’s strongly bearish, right!? Yes I could close it, why not, 200 pips is a great profit, isn’t it? I will stay in position until beginning oth next week and see on Monday what to do. 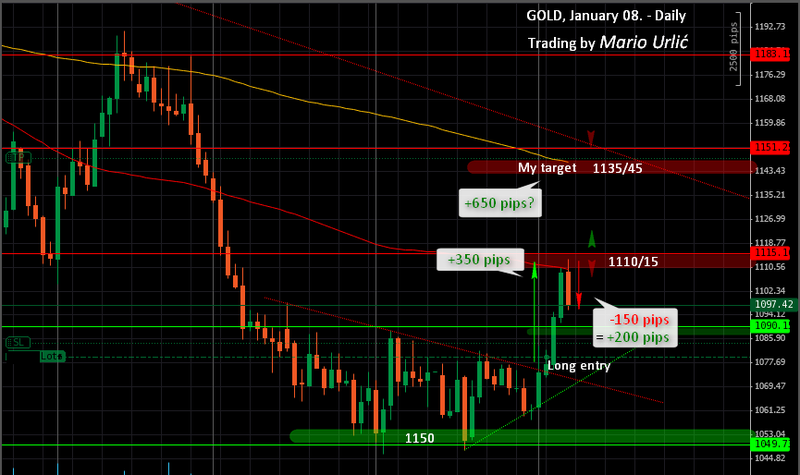 1100 could be my closing point, if gold don’t brake 1110/15. It’s up to me and it will be up to you for so many times in your trading career, trust me. How? I tried all the possible options and I ‘failed’ a hudreds of times in my career making this choice. What I mean by failed? I mean, that for so many times I have closed my position ‘too early’ and on the other side, waited for ‘too long’. That’s trading and there is no way to awoid the situations like this one. What important is to make a decision and when you make it, there must be no regrets! Whatever you decide, to close the position ‘to early’ or to wait for ‘too long’ and whatever happens because of your choice, you have to accept it as a normal development in the market. Otherwise, you will start making mistakes one after another angry on the market, you will lose day after day.